Be it a dull, throbbing ache or a blinding pain; headaches tend to turn your day upside down. Plans quickly go down the drain when you feel the onset of a terrible headache. Headaches have become a constant part of the hectic lives we lead. As annoying as reoccurring headaches can be, reaching for a pain pill may not be the best idea for your long-term health. Overuse of painkillers can actually lead to the development of more headaches. Natural remedies are the best option to get rid of this health condition. Here are five home remedies that can help you get relief from a headache fast without any medicine. Headaches are a common symptom of dehydration, otherwise known as the condition when the body has not consumed enough water to perform necessary bodily functions. 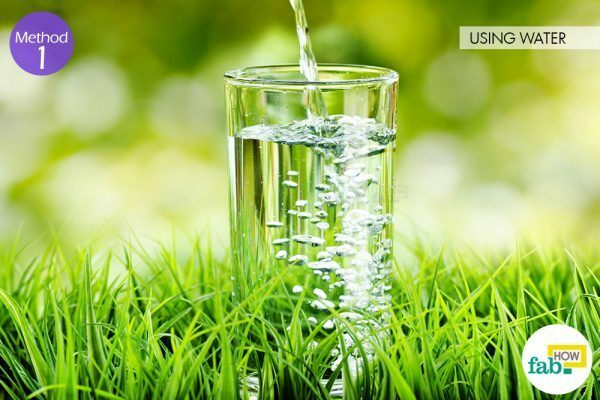 Water ranges from 75% of infant body weight to 55% in elderly body weight and is essential for maintaining cellular function and human wellbeing. If your daily water consumption is less than 2 liters, your headache is most likely caused by dehydration. Drinking water is the easiest way to hydrate your body in the event of a dehydration-induced headache. Instead of gulping down the water, which may cause nausea and bloating, drink it in small sips to get rid of your headache quickly. 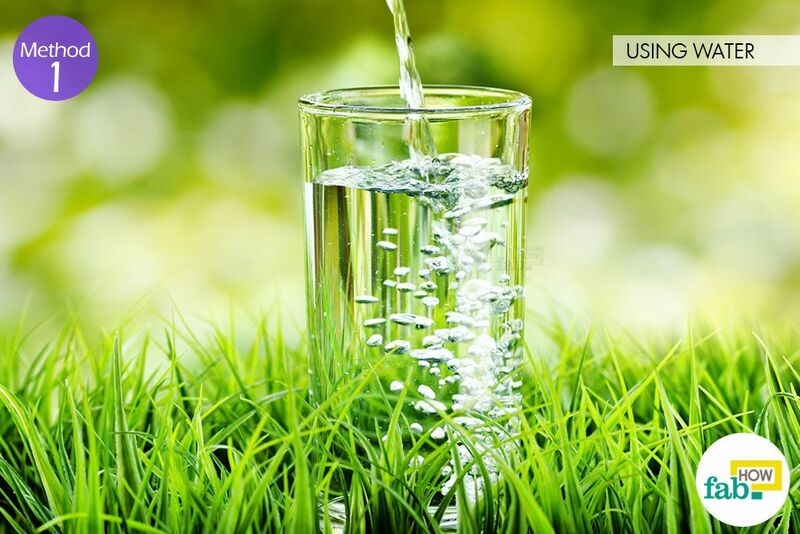 Continue drinking water throughout the day even after pain relief to prevent reoccurrence. Apple cider vinegar or apple cider vinegar is one of the oldest known natural home remedies and is beneficial against a variety of minor ailments. It may also prove effective in relieving your headaches quickly. If you’re not a fan of the taste, you can add a little honey and lemon juice to improve the flavor. 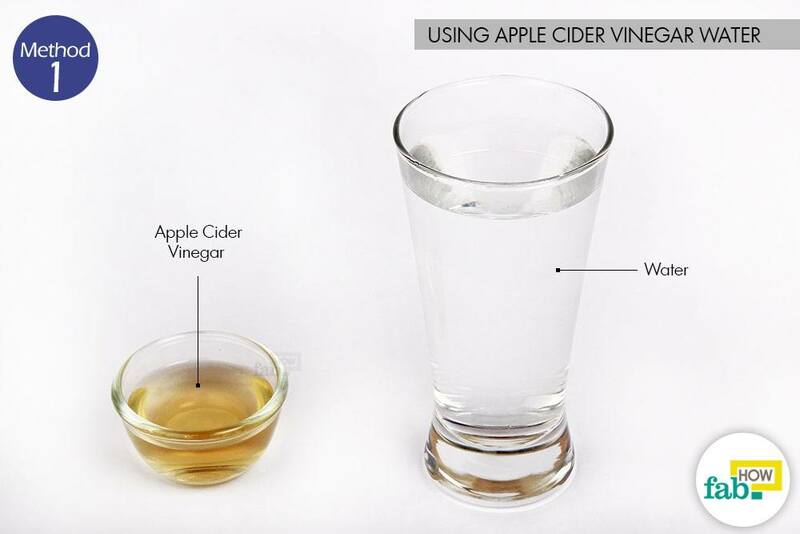 Add 1 to 2 tablespoons of apple cider vinegar to a glass of warm water. 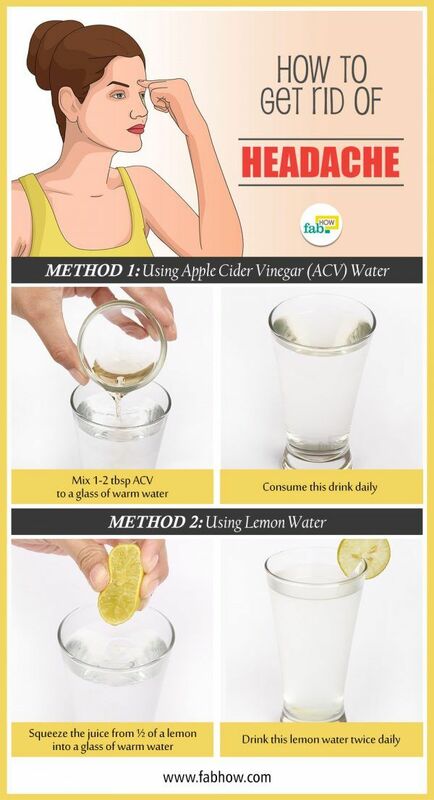 Slowly drink the apple cider vinegar water to get rid of your headache fast. 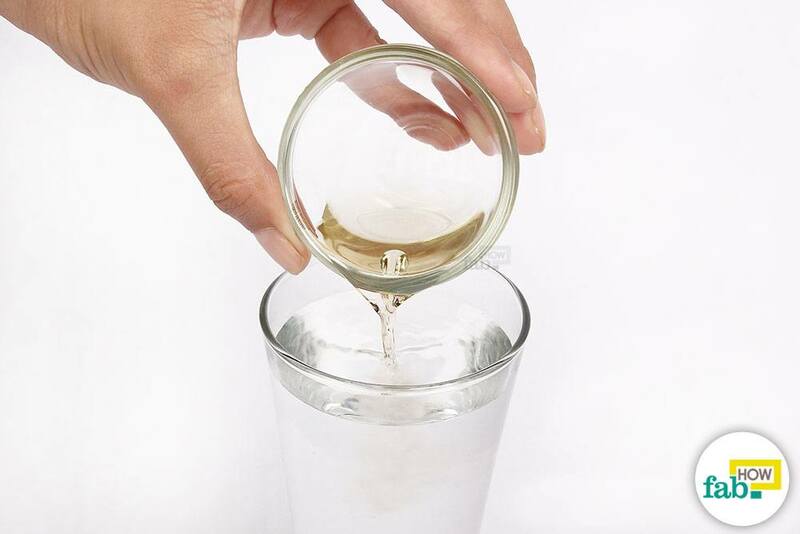 Consuming this drink daily balances the fluids in your body, thus keeping you hydrated. Lemon water might also subdue a headache stemming from dehydration. 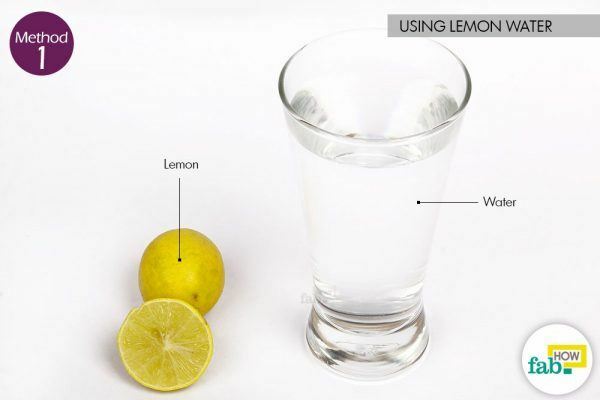 Drinking lemon water not only helps with your headache but also balances the pH level in the body and aids digestion. 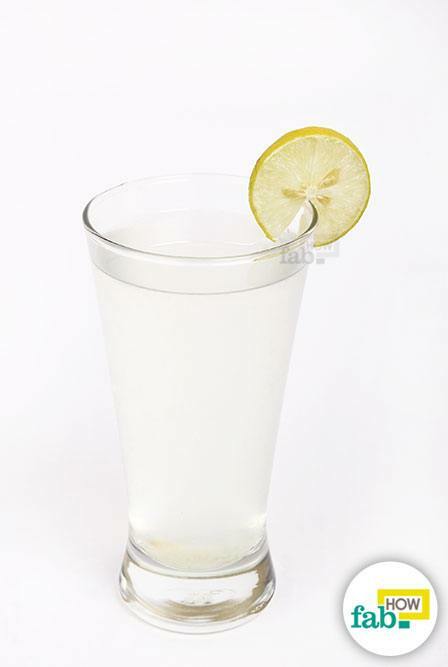 Lemon water is a health tonic that, if consumed occasionally, can rectify many bodily functions. 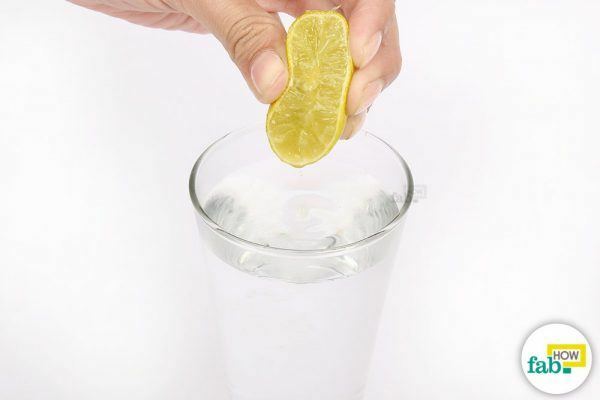 Be sure to use freshly squeezed lemon for your water and not bottled lemon juice since the latter is usually full of unnecessary sugar and preservatives. Squeeze the juice from half of a lemon into a glass of warm drinking water. Slowly drink this lemon water while it’s still warm. 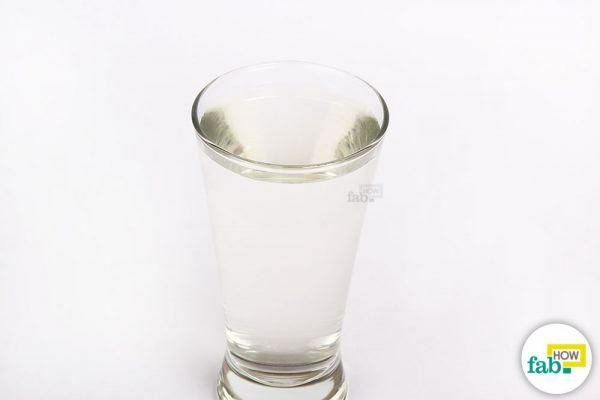 Consuming this drink twice daily will also cure headaches induced from gastric distress. 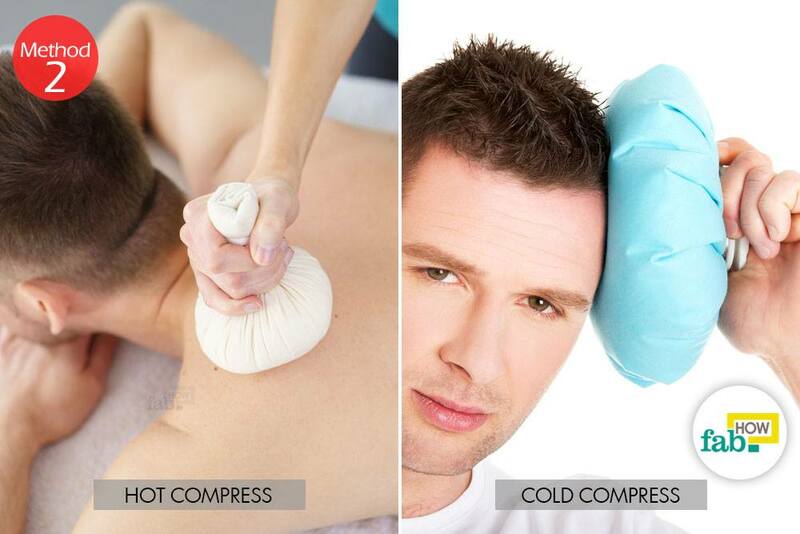 A hot or cold compress is an effective way to deal with headaches. It makes use of temperature therapy, which has proven quite useful to treat a variety of aches and pains. Individual preferences may vary, but generally, migraine patients prefer cold packs. On the other hand, if your headache is induced by stress or a cold and congestion, you may prefer warm packs. A cold compress should be applied on the forehead and the temples, while a hot compress should be applied on the back of the head and neck for fast relief from headache. Repeat the process for some time until you get relief. Cold packs can be made using ice cubes or simply a bag of frozen peas. A hot water bottle or a rice heating pad may do it for the hot compress. You may also take a hot or cold shower for the same effect. Coffee and tea can also be used to subdue headaches. These two beverages are among the most popular headache solutions. The caffeine present in coffee and tea can help curb a headache. When the inflamed blood vessels press against the nerve endings, it results in throbbing pain. Caffeine constricts these blood vessels, which helps ease the pain. 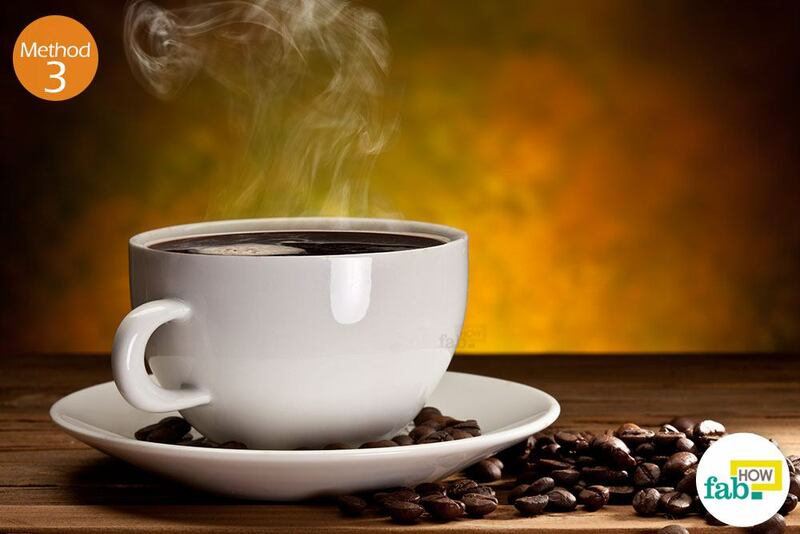 Caffeine is also said to aid the effectiveness of pain relievers by helping the body absorb them more readily. Drinking a soothing cup of tea is probably the best way to alleviate headaches fast. Ginger-lemon tea can help with headache pain and ease nausea that usually accompanies migraines. Herbal teas like chamomile tea are also beneficial. If you’re suffering from a cold-induced headache, cinnamon tea may be the solution you need. This spice is rich in magnesium, which is helpful for headaches. Iron, calcium and other minerals present in cinnamon also help alleviate migraines and headaches. There are some points to keep in mind when using these beverages to counter headaches. If your headache stems from dehydration, caffeine may not be such a great idea as it has a dehydrating effect. But tea, especially green tea and herbal tea will keep you hydrated. Peppermint essential oil is quite soothing and can subdue the pain. It relaxes and calms your mind, helping you sleep off the headache. Eucalyptus essential oil can reduce the swelling in the blood vessels, which helps lessen the pain. Gently massage the essential oil of your choice, or a blend of essential oils, onto your temples and the back of your head and neck to ease headache pain. You can combine aromatherapy with steam treatment to get maximum benefits. It will help clear up congestion or cold-related headaches as well. Acupressure is an ancient Chinese technique that has proven effective to cure various ailments, including headaches. It works by releasing endorphins upon applying pressure on certain points in an area of the body. Endorphins are natural painkillers that can help relieve pain. 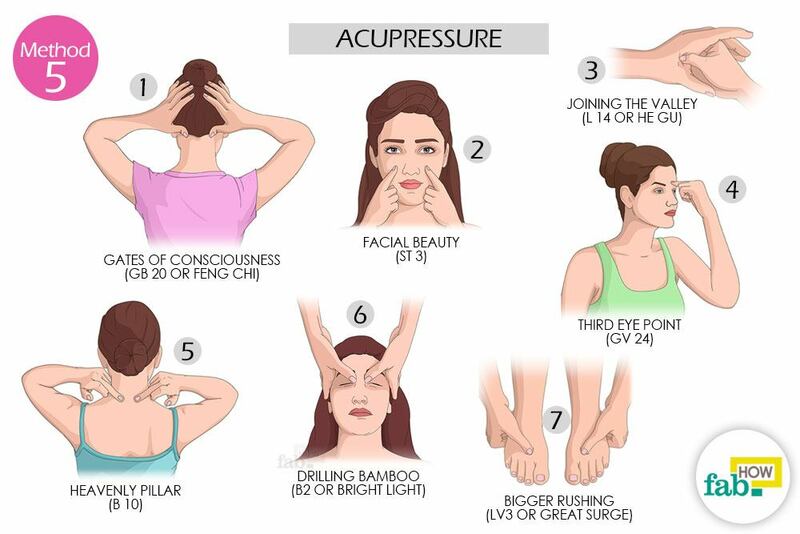 With some effort, you can easily administer acupressure in order to relieve headaches. All you need to do is locate the pressure point and apply firm pressure over it for about 10 seconds. Repeat the activity until you feel relief. Stimulating 1 or 2 of the given pressure points can help with your headache. Locate the pair of pressure points at the base of your skull, in the valley between the vertical neck muscles. These pressure points are about 4 finger-widths apart from each other. Place your thumbs over them, wrapping the rest of your fingers around your head, and apply pressure. Another pair of pressure points are located under your cheekbones, about 2 to 3 finger-widths away from the nose on either side. They’re directly below the middle of each eye. Apply pressure with your pointer finger. This is especially helpful in congestion-induced headaches. Locate the web where your thumb and pointer finger appear to meet. This pressure point is easy to find. Apply pressure with the pointer finger and thumb of your other hand. Repeat with the other hand. Located at the middle point between the eyebrows, this pressure point is the easiest to find. It dissipates stress and fatigue, alleviating headaches induced by these factors. Another pair of pressure points are located ½ inch below the base of the skull. These points lie at a distance of a ½ inch from the spine on either side. Next pressure points are located on either side of the nose at the conjunction of the bridge of the nose and the eye socket, just below your eyebrows. Apply pressure using your pointer fingers to relieve stress or cold-induced headaches. This pressure point is located on your foot, at a distance of ½ or 1 inch from the joining point of the big toe and the second toe. If your headache is induced by congestion, you may take apple cider vinegar in the form of steam treatment. 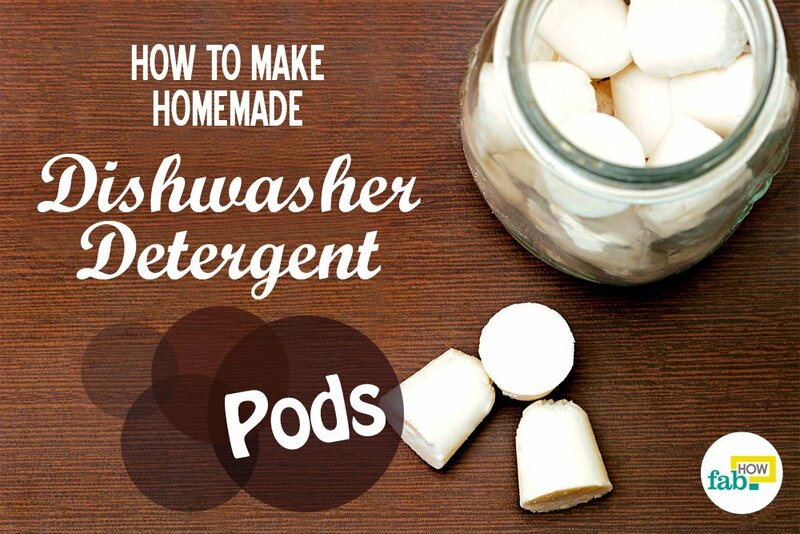 Combine ¼ cup of apple cider vinegar with 3 cups of boiling water in a bowl. Bend your head over the steaming bowl and breathe in the apple cider vinegar steam until the water cools down. You may also hold a towel-tent above your head to contain the steam. You can also apply apple cider vinegar as a topical massage treatment on your temples to cure a headache. To get rid of persistent headaches, eat magnesium-rich foods. Avoid alcohol, cheese, and processed meats and keep yourself hydrated. You can also hydrate your body by taking in lots of fluids and eating veggies and fruits. A paste of cinnamon powder and water can also be applied on the forehead to relieve headaches. If your headache is due to fatigue, a rest may be in order. Check if your headaches stem from your inactive life. Include light exercises and stretches in your daily routine. Yoga and meditation can also help you with stress and fatigue-induced headaches. A relaxing foot soak is a great way to deal with fatigue and stress-induced headaches. Acupuncture has proven to be immensely effective in curing and preventing headaches. While it may be a little costly, you may get long-term results. However, it is important to ensure that you get acupuncture treatment only from a trained practitioner. Rizzoli P, Mullally WJ. Headache. Philosophical Transactions of the Royal Society B: Biological Sciences. https://linkinghub.elsevier.com/retrieve/pii/S0002934317309324. Published January 2018. Popkin BM, D'Anci KE, Rosenberg IH. Water, hydration, and health. Nutrition Reviews. https://www.ncbi.nlm.nih.gov/pubmed/20646222. Published August 2010. Serap, Coskun, Inan, Yonca. Cold Therapy in Migraine Patients: Open-label, Non-controlled, Pilot Study. Evidence-Based Complementary and Alternative Medicine. https://www.hindawi.com/journals/ecam/2006/321640/abs/. Published 2006. Richard B. Lipton H-CD, Matthew S. Robbins, Sandy Yacoub Garas, Ketu Patel. Caffeine in the management of patients with headache. The Journal of Headache and Pain. https://thejournalofheadacheandpain.biomedcentral.com/articles/10.1186/s10194-017-0806-2. Published October 24, 2017. Sasannejad P, Saeedi M, Shoeibi A, Gorji A, Abbasi M, Foroughipour M. Lavender Essential Oil in the Treatment of Migraine Headache: A Placebo-Controlled Clinical Trial. Dermatopathology. https://www.karger.com/article/Abstract/335249. Published April 17, 2012.